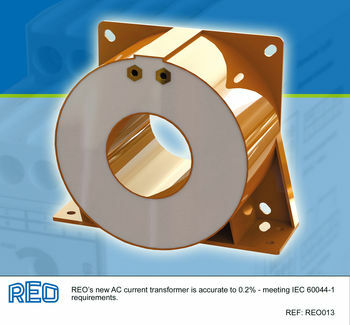 REO’s new AC current transformer is accurate to 0.2% - meeting IEC 60044-1 requirements. Current transformers are used to isolate low voltage monitoring circuits from higher power circuits when monitoring or measurement must take place. A current transformer produces a reduced current accurately proportional to the current in the circuit, which can be connected to measuring and recording instruments. Current transformers are commonly used in metering and protective relays in the electrical power industry. Historically only AC waveforms could be monitored, but now, thanks to conditioning electronics, DC and complex waveforms can also be measured accurately, usually as feedback for equipment and systems. This regulates output with respect to some dynamic characteristic, for example, the resistance of a load that changes as it heats up. Two interesting examples of the product’s use can be found in military applications. Torpedo motor speed is monitored using current transformers by one European manufacturer, to ensure that the torpedo is speedily and accurately targeted. Another application is servo motor current for automated turret stabilisation and automated aiming on tanks. The objective is to ensure that the tank can fire accurately regardless of the speed and terrain upon which it is travelling. Key to this system is the monitoring of current in the servo motors to provide linear and accurate feedback. REO’s range is competitively priced with electrical and physical characteristics that allow the products to be used as drop-in replacements in applications where competitors’ devices are being used. REO also offers bespoke electrical characteristics and physical form, fixings and connections. For example, REO owns a patent on a design which provides accurate and repeatable readings, no matter where the conductor passes through the aperture. The standard designs utilise automatically wound cores, housed within encapsulated housings to ensure robust mounting and protection from physical and environmental shock and vibration. These designs allow fast and straightforward mounting for control panels and industrial equipment, but also ensure consistent and reliable operation at pressures and temperatures which exceed that of normal electrical components. The magnitude of current is typically up to 3000A at a frequency response from DC to 150 kHz. REO also produces differential current sensors, through which all connectors from a three-phase system is passed and the resultant value used for measurement purposes is the difference.